The elliptical trainer is a perfect way to increase your fitness and stamina without putting excessive pressure on your joints. But, there are so many different ones on the market how do you choose the right one for your needs? I’ve taken a look at the Livestrong vs. Horizon elliptical and am convinced that the Horizon is the best one for the job. Of course, you’ll ask why this is the case. I’ve been lucky enough to try machines from both manufacturers over the last few months. There is no doubt that they both have a great deal to offer. But the Horizon triumphs on price, number of features and the quality of its build. It’s a close call but if I had to spend my own money on one of these machines it would be the Horizon. This review should highlight why. This machine is clearly built to maximize strength training and isolated toning. It also has an excellent warranty. You’ll find it’s exceptionally easy to get started on the machine and it is perfectly designed to maximize your workout, even in the comfort of your own home. This is a low priced machine, competing with the budget options while offering the facilities and features you would expect to find on a medium range elliptical trainer. This makes it an enticing option for those on a budget or anyone who doesn’t want to invest too much in their new fitness regime. The steps on this elliptical trainer are very low; this makes it exceptionally easy to step on and off. While this may not be a consideration for everyone it will certainly make it easier for those who are recovering from an injury. It also places less strain on your joints as you climb on and off. You might be please to note that it can accommodate a 20” stride. 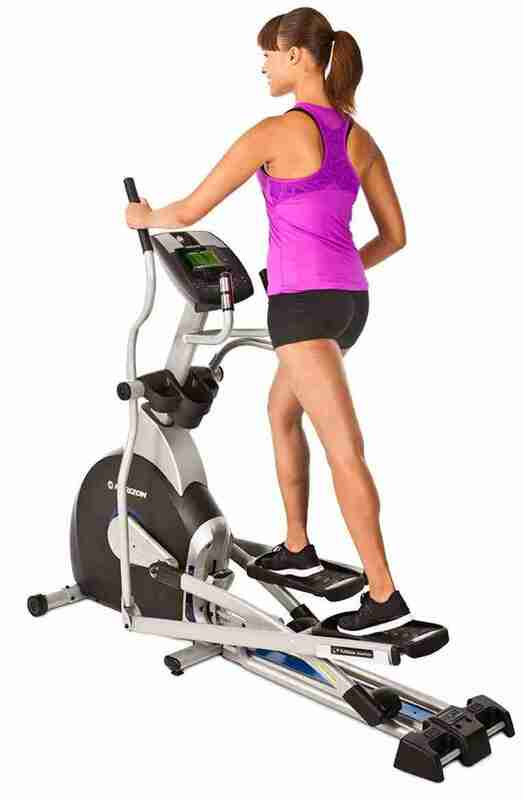 The Horizon elliptical trainer is designed to handle up to 300 pounds. This makes it viable for all but the heaviest of people. This machine uses the Via Fit system to allow you to send your workout to any fitness app you choose. It should work with all apps currently on the market! This will allow you to track your progress and plot a new goal every time you achieve your existing one. It should also help to keep your workouts interesting. The warranty on this machine is generally excellent. The manufacturer offers a lifetime warranty on the frame and the motor. It also gives you 1 year for all parts and another year to cover labor. This means that you should be able to get your machine repaired without having to pay a penny; that’s peace of mind! There is just 10 different workout programs. These cover speed, endurance,cardio, muscle building and even strength training. This ensures you can find the right option whether you are new to working out or have been doing it for many years. Each program will have a different range of settings for resistance and incline; ensuring you are challenged and kept interested in your workout. You can also purchase a passport player which provides videos of scenic destinations from round the world. The movement of these adjusts to match your pace; allowing you to feel like you are actually there. It is worth noting that this is sold separately to the machine. You can also use the docking system for your iPod and the built in speakers to help focus your mind on something other than your exercise. The truth is there is very little to complain about with this machine. The following points are certainly not deal breakers; but they are worth knowing. One thing that makes a workout easier is being able to quickly adjust the incline while you exercise. This is not possible on the EX-69-2. If you want to increase the incline you need to stop exercising, manually adjust it and then carry on. It is worth noting that this is not the same for the resistance settings. The machine arrives for free to an internal space on the ground floor. You’ll then have to shift the 185 pounds to where you intend to build it. Although there is an instruction manual with the EX-69-2 it is lacking in detail. This can make it challenging to build the trainer before you can use it. Ideally have a friend available and plenty of time. Although the warranty is generally excellent Horizon are only offering 1 year on the labor. Considering the quality of the machine this is not as impressive as you would hope or as good as some other manufacturers. This is a quality machine and worth considering. However, you’ll quickly notice that it simply doesn’t offer the same range of options as the Horizon. This is a shame considering that both machines are available in the same price bracket. Size is 24 x 67 x 76 inches. The LS8.OE is designed to feel as natural as possible. Every foot and hand position has been calibrated to ensure you have a smooth, natural and resistant free workout. The 20” stride is the same as the EX-69-2. 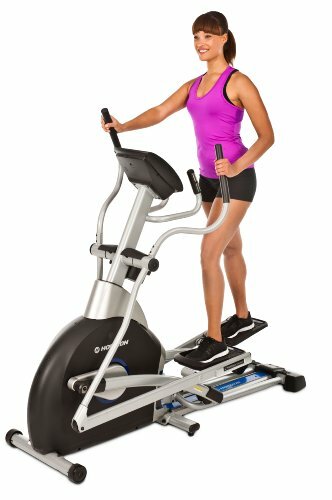 This is long for an elliptical trainer and makes the machine practical for virtually any sized person. A nice touch is the addition of a cooling fan. The speed of this can be adjusted as you workout; to ensure you stay relatively cool and fresh. You’re probably still going to want a shower afterwards, but it does help! This is a heavy duty flywheel which helps to ensure the machine runs smoothly. Sadly, despite a great effort even this is not up to the same standard as the 25 pound flywheel of the Horizon EX-69-2. It’s not surprising to find that the LS8.OE is equipped with speakers and a connection for your mp3 player. It may not be surprising but it is still appreciated. This helps you to set the pace and enjoy your workout while listening to your favorite tunes. At 192 pounds this is a heavy machine to move round by yourself. In fact it would be a workout by itself. While this helps to contribute to its stability it does mean that you need to choose a location and stick with it. The incline has 5 settings which can be manually adjusted. This is better than nothing but extremely disappointing compared to the majority of other machines in this range. Several users have reported an issue with the console. It appears that the calories are not counted correctly and the heart rate monitor is not as accurate as it should be. This is disappointing as it makes it difficult to trust any of the other readings displayed on the dual console. It is also a shame that your heart rate is only monitored through the handgrips; there is no chest monitor included. You can also monitor your time, resistance, speed and incline rating. But you can only adjust your resistance while using the machine. The Horizon had a disappointing labor warranty. Unfortunately the Livestrong is worse. The frame has a lifetime warranty but the parts and labor are just 1 year. There are 9 different workouts. This is poor in comparison to the EX-69-2 which has 10 but a much more comprehensive range of programs. In fact, it is poor in comparison to many of the other offerings in this price bracket. These include climb and muscle toner but do not provide the same scope of movements as the elliptical from Horizon. The bottom line in the Livestrong vs. 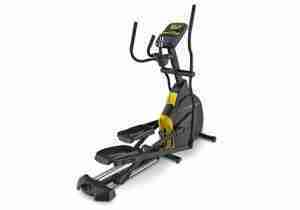 Horizon elliptical comparison is that they are both excellent entry to mid level machines. Put simply the EX-69-2 gives you more options and a better level of warranty; making it the right choice for you, whether you are new to exercising or not.